Sir David Amess Conservative Candidate lives in Southend with his wife Julia and their five children. 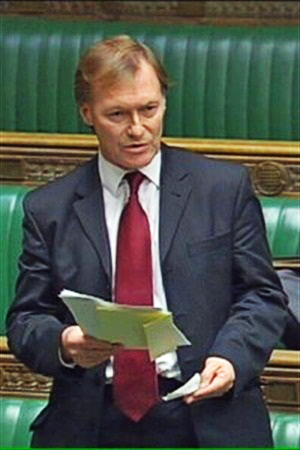 He has been a member of parliament since 1983 and has represented the constituency of Southend West since 1997. He has been extremely active as an MP, sponsoring bills such as the Pet Animals Bill in 1990, the Abortion (Amendment) Bill in 1996-7 and the Warm Homes Bill which passed in to law in December of 2000. David's favourite charities include the Fairhaven and St. Luke’s Hospices and the Salvation Army. He enjoys reading, writing, sports and gardening. Surgery held on the 1st and 3rd Friday of each month from 9.00am – 12.00 noon in Iveagh Hall. No appointment necessary, first come first served. Socialising, reading, writing, sports, modern music, keeping animals, gardening.